The EU-RL SRM has developed a pesticide ranking list for fruits and vegetables to assist the decision-making process when it comes to enlarging the scope of pesticides and metabolites targeted in laboratories. The pesticide ranking list is based on a points system which takes into account various aspects indicating the relevance of pesticides such as toxicology, residue findings in food samples, pesticide use, and potential unauthorized use in agriculture. The data used for the pesticide ranking were mainly derived from EFSA, CRL Data Pool (www.crl-pesticides-datapool.eu) and Pesticides-Online. Agricultural usage data considering pesticide approvals and registrations as far as available. Pesticides with a high potential of unauthorized usage as well as persistent pesticides expected to be encountered in samples via environmental pollution are also taken into consideration. For more details on the point system CLICK HERE. The current point system is continuously being improved and open to discussion. Any feedback on this issue is welcome. During the 2nd Comprehensive Pesticide Lab Survey all official labs within the EU Member States, other EEA countries and the EU candidate countries were asked to indicate their current pesticide scope targeted in different sample types. 188 laboratories reported their pesticide scope routinely targeted in fruits and vegetables. 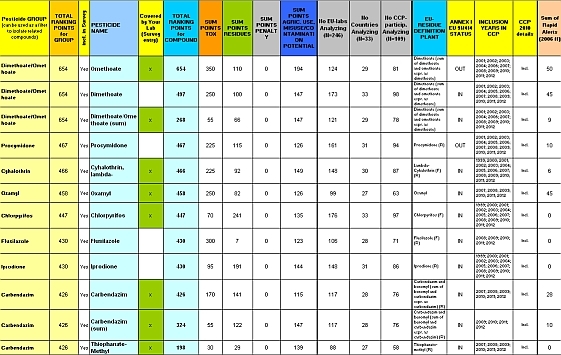 In May 2010 the calculated pesticide ranking list, supporting information and the individual pesticide scope for fruits and vegetables were sent to each participating laboratory. By comparing their pesticide scope with the ranking list, laboratories are able to identify analytical gaps and gain the ability to judiciously adjust their analytical scope in a target-oriented fashion ("Check Your Scope"). As a multitude of data collections containing data that may change with time and that are not comprehensive were used to construct the list, the ranking list is prone to errors and should serve as a starting point and for orientation. The final judgment should always be at the discretion of experts. Read the feedback-survey on "Check Your Scope"-List 2010: CLICK HERE.